Alice (Lisa Wilcox) and her boyfriend Dan (Danny Hassel) are enjoying a dream-killer free year after the events of A Nightmare on Elm Street 4. Alice has a disturbing dream about the origins of Freddy (robert Englund), and before long she discovers he is using her unborn child to draw people into his clutches. While Freddy is busy carving his way through Alice’s friends, her only hope is to uncover the remains of his mother, Amanda (Beatrice Boepple), and hope that her spirit is strong enough to put him down once and for all. 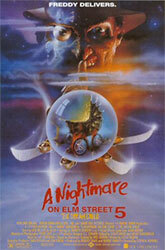 A Nightmare on Elm Street: The Dream Child has a distinctive gothic appearence that sets it apart from the rest of the series. Despite a few great looking moments (Freddy turning someone into a cyborg motorcycle and a comic book inspired battle with “The Phantom Prowler”), The fifth A Nightmare on Elm Steet just feels kind of tired. Nothing feels phoned in exactly, although Englund’s performance is lacking much of that sparkle that makes Freddy so much fun to watch. The Nightmare series has never been a bastion of brilliant plots, but the story here doesn't make a whole lot of sense. Normally, this wouldn't be a problem, but these films have always been slightly more plot driven than most slasher fare. It definitely feels like the well is running dry at this point.